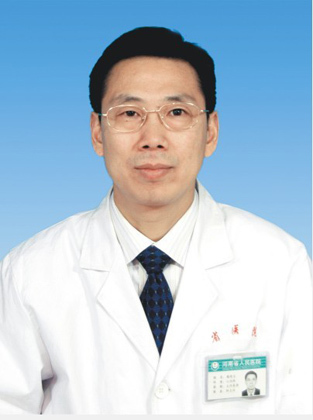 Gao Chuanyu, chief physician, M.D., PhD supervisor, is the vice president of Henan Provincial Cardiovascular Hospital and director of Department of Cardiology. He is a famous cardiology specialist in Henan Province with the special government allowance of the State Council and a national labor model. He is a member of Chinese Society of Cardiology and chairman of Henan Society of Cardiology. From 1996 to 1999, he studied interventional cardiology in St Vincent's Hospital in Melbourne, Australia. By now, he has completed more than 10,000 coronary intervention cases through PTCA, stent implantation, atherectomy and laser angioplasty. He has rich clinical working experience and is capable of independently solving the commonly complex and difficult diseases. He is committed to the clinical diagnosis and treatment of coronary heart disease as well as the clinic-oriented cutting-edge and basic research. He is the chief editor of 7 monographs and has published 152 papers on domestic and overseas journals, won one Third Prize of Chinese Science and Technology Award, one Second Prize of National Science and Technology Award, 3 Second Prizes and 2 Third Prizes of Henan Science and Technology Progress Award, 2 First Prizes and 2 Second Prizes of Science and Technology Award of Henan Provincial Health Bureau. His invention of femoral artery hemostasis device obtained new-type instrument patent in 2000.